Before the sun rises I’ve gathered my tools. The air is soft, cool, sweet. Delight. Muddy. Better get my garden boots on! I set everything up, bouncing from the yard to the porch and back again — making sure everything is just right. Dancing among the highest branches of the trees. I wait patiently. Take a cleansing breath. Light the offering candle. A deep breath — arms rising slowly — energy rumbling under my feet, entering my body, shooting up through the chakras. My hands grow warm. Palms pulsating. I take a deep breath and push, the energy flying from my hands like white hot bolts. The circle casting has begun. “I call thee forth,” echoes my voice as morning dew glitters at my feet — the quarters — intoned. Summoned. Stirred. Blessed. I walk the perimeter of the garden carrying my staff, filled with the blend of nature around me. The power continues to surge. 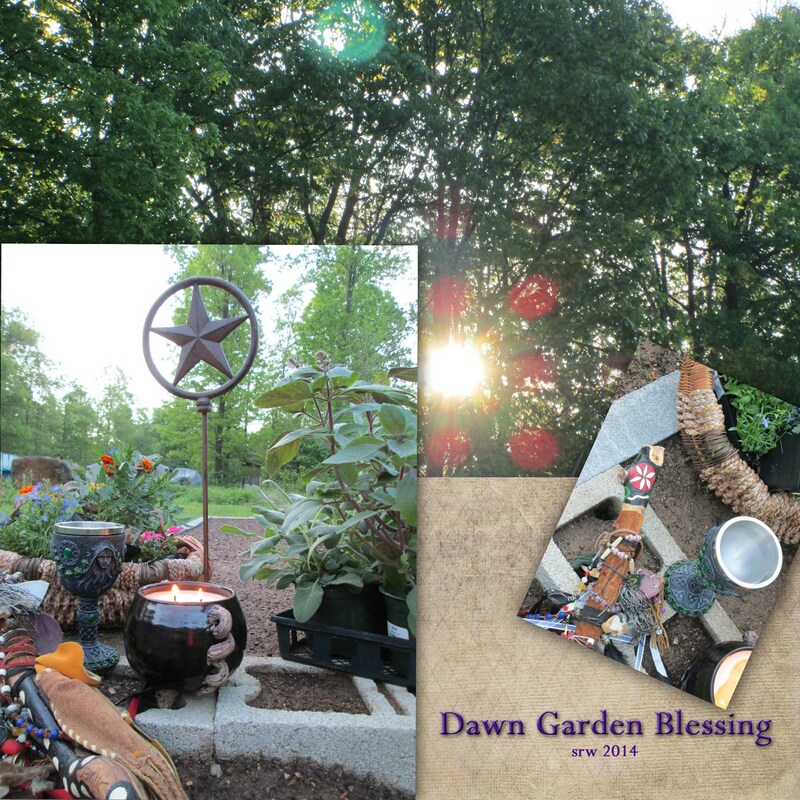 I call upon Spirit, asking for abundance, good health, and protection for my garden. A hawk swoops and circles. I thank deity, close quarters, and pour the circle energy into the garden soil. Maybe then we would be free. Water Offering with fresh herbs and flowers from the hearthstone. Healing Circle began to the gentle sound of the spring rain at twilight, the soft scents of the woods permeating the ritual space. 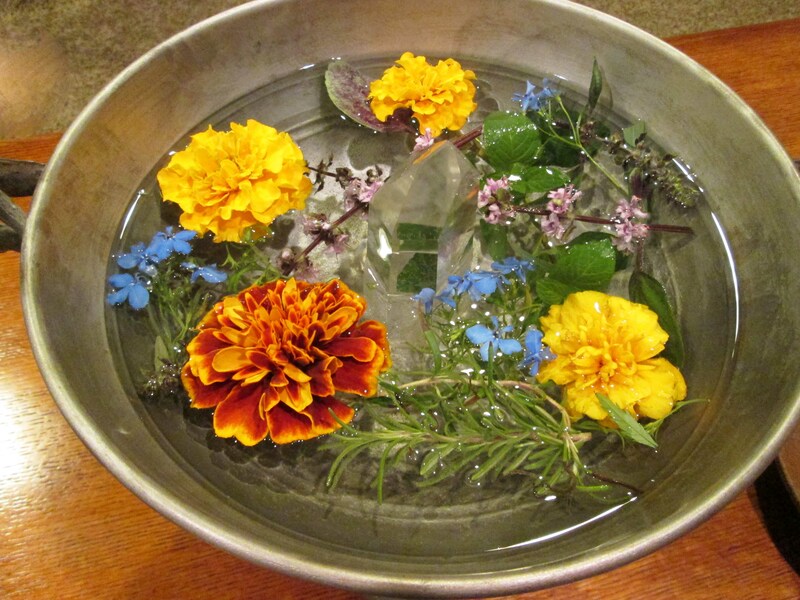 Our holy water this week was infused with marigolds (for success), Lobelia (for protection), Rosemary (for healing), African Basil (for blending), Hyssop (for cleansing), and Peppermint (for success). 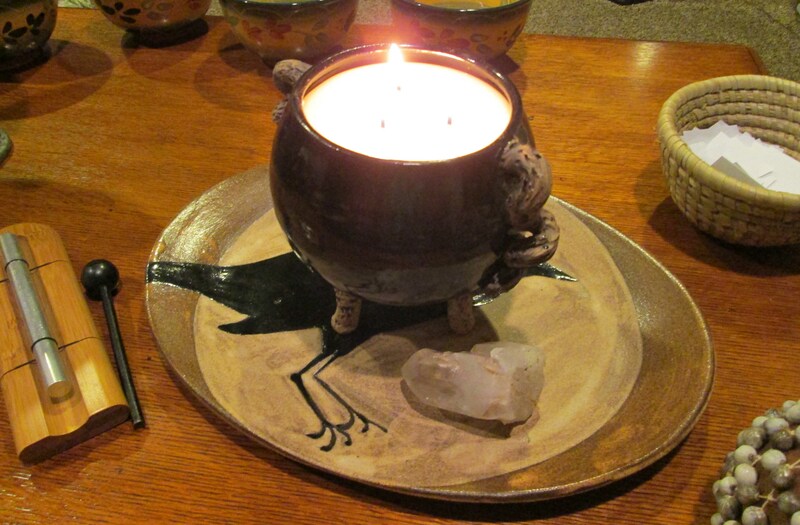 Cauldron Candle poured on the Scorpio Moon in preparation for our healing circle. The cauldron candle, poured moments before the exact Full Scorpio Moon on Wednesday, consisted of all natural soy wax, bits of peppermint, sassafras, and cinnamon with Oatmeal, Milk and Honey fragrance. Our Mother Candle, burning in another area, was also poured on the Full Scorpio Moon — a mixture of sweet violet and patchouli with bits of patchouli herb and African Violet petals. Together, we worked for approximately 150 requests — the blend of petitions from this blog, my FaceBook pages, Twitter #healingmagick, and local requests. Thank you all who participated in a most magickal evening!